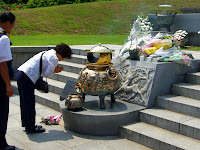 I first visited 국립서울현충원 (Seoul National Cemetery), located in 서울 (Seoul, South Korea), with 숙현 (Sook-Hyeon) on 06 June 2009 to observe Korean life on 현충일 (Memorial Day). Numerous civilians and soldiers walked the alleys of this huge cemetery under a bright sky; many paying homage to 육영수 (YUK Young-soo) and her husband, the ex-president 박정희 (PARK Chung-Hee), assassinated in 1974 and 1979. I was flabbergasted to see whole families gaily picnic among the tombs as I cannot imagine French people doing so but was told this is a normal way to commune with one's kin in South Korea. The vegetation and hills contributed to a peaceful and pleasant atmosphere while providing some intimacy. After seeing atrocities displayed so gloomily (see Post 17 May 2009) at 독립기념관 (Independence Hall of Korea) in 천안 (Cheonan), this uplifting experience made me feel closer to the local population.